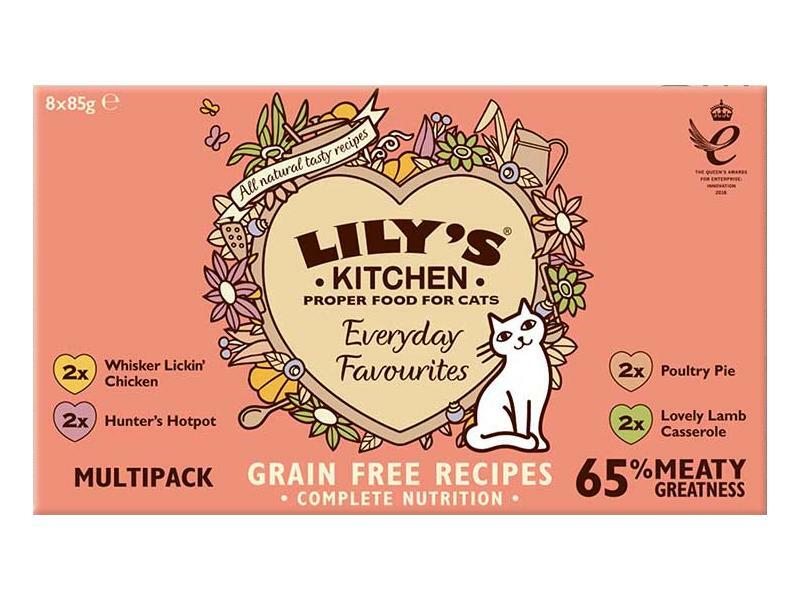 The Lily's Kitchen Everyday Favourites are a handy 8 pack of 4 different, equally delicious, natural and healthy cat food recipes. Full of 65% meaty greatness (the freshly prepared meat and offal that cats thrive on), the rest is a perfect balance of moisture for hydration with vitamins and chelated minerals for optimal absorption. Everyday Favourites are composed with complete and balanced nutrition including essential taurine, vital for your cat’s health. All natural and grain free recipes, no meat meal, bone meal or animal derivatives is used. Lamb 30%, Chicken 20%, Pork 15%, Salmon Oil, Chelated Minerals. Turkey 50%, Duck 15%, Salmon Oil, Chelated Minerals. Chicken 25%, Game 15%, Pork 15%, Turkey 10%, Salmon Oil, Chelated Minerals. Crude Fibres 0.3%, Moisture 82%, Taurine 723mg/kg. 81kcal/100g. Crude Fibres 0.3%, Moisture 82%, Taurine 723mg/kg. Crude Fibres 0.3%, Moisture 81%, Taurine 723mg/kg. 81kcal/100g. Nutritional Additives (per kg): Vitamin D 100 IU. Technological Additives (per kg): Carrageenan 5.3mg. Just right for a single serving. The amount your cat needs to eat in a day depends on things like age, breed, neutered status and how active your cat is. You’ll find feeding guidelines on the back of every pack. They can be used as a general guide, together with a good sense and experience. For overweight cats, speak to your vet about a weight loss program using our food. There are currently no questions for Lily's Kitchen Everyday Favourites for Cats - be the first to ask one!